Patty Demere has lived in her Everglades City trailer home for about a decade. Hurricane Irma flooded the trailer and left mold and mud behind. Demere is working with FEMA for help to rebuild. She holds her son Augustus on her hip. He's youngest of five. This was the master bedroom, which has been gutted. The hallway of the trailer. Debris waiting for pickup outside of Patty Demere's home. Patty Demere's trailer. 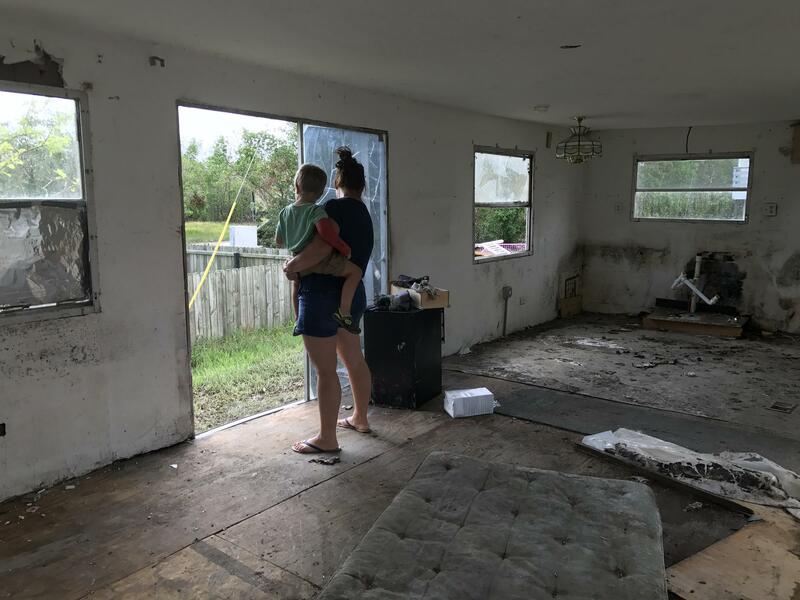 She and her husband plan to rebuild a larger home for them and their five kids, after Hurricane Irma destroyed their current home. "So this is our little place here," says Everglades City resident Patty Demere. She's holding her youngest of five children, Augustus, on her hip. From the street, they’re looking at what used to be their trailer home. 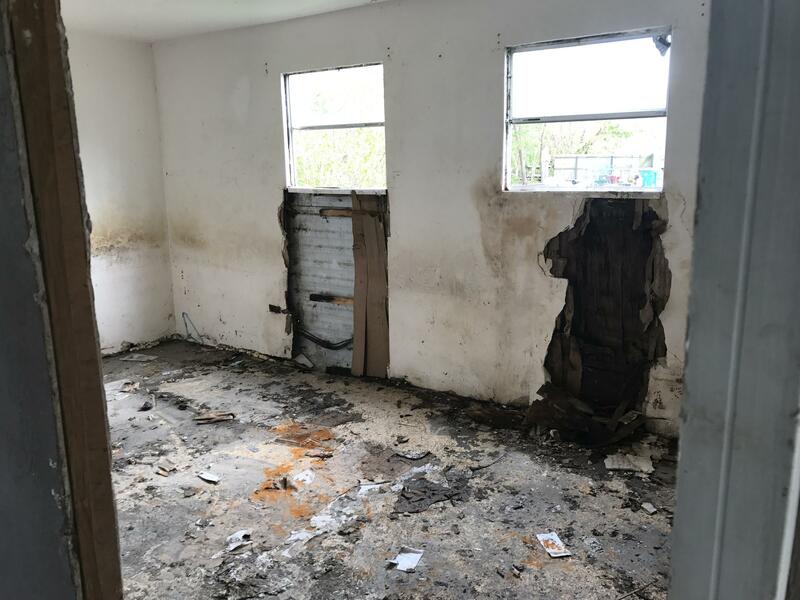 Now windows are missing, gray mud is spread across the lawn and patio deck, and there’s a pile of debris in front of the property that’s almost as long as the two-bedroom mobile home itself. But Demere says the worst of the damage is inside. As she walks across the lawn to the front door, she says, "Careful that's muddy." Gray mud settled everywhere, including inside the house. It takes Demere a couple pulls to pry the trailer front door open. "We've taken the carpet out so you can’t see what was on top of the carpet, but if you go and look that direction see how the water line is and all the mold started growing up," she says. Floodwaters left dark blotches a few feet high on the white walls of what used to be the kitchen. And above that waterline is spotted mold. Demere and her family gutted just about all of the trailer’s insides. "You don’t want it to be like this, but we wanted to kind of rebuild and get something bigger so that's what we had been looking into anyway," she says. "We were just kind of waiting for the time and I guess the time is now." For now, Demere’s family is staying at her mother-in-law’s house in Estero—more than an hour away. They make the commute daily for her husband’s work, the kids’ school and after school activities. 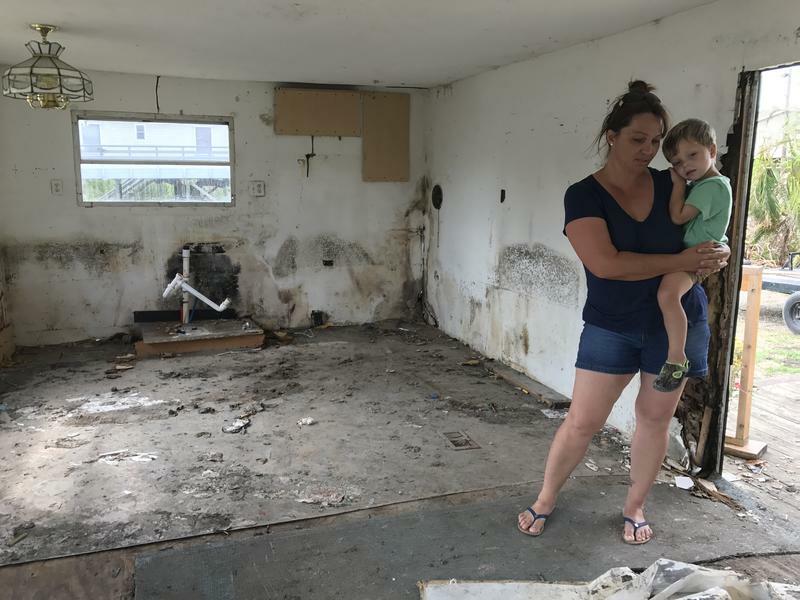 She’d like to get some temporary housing in Everglades City, while they rebuild. "It's hard to drive back and forth and our kids play sports so they’ve got practice and they’ve got games. So it's been tough," she says. Demere and her husband applied for assistance from the Federal Emergency Management Agency, and she says she’s been told they’re going to get help, but she hasn’t been given any details just yet. "Number one: was how much impact the hurricane had on the federal system in Houston, so the federal resources were heavily drained for that event," says Summers. "Number two: of course, is the almost 60 counties in Florida being impacted by Irma, so there was again a very large drain on state and federal assets. And then that's being compounded by the catastrophic conditions in Puerto Rico where FEMA is also answering the call for service." 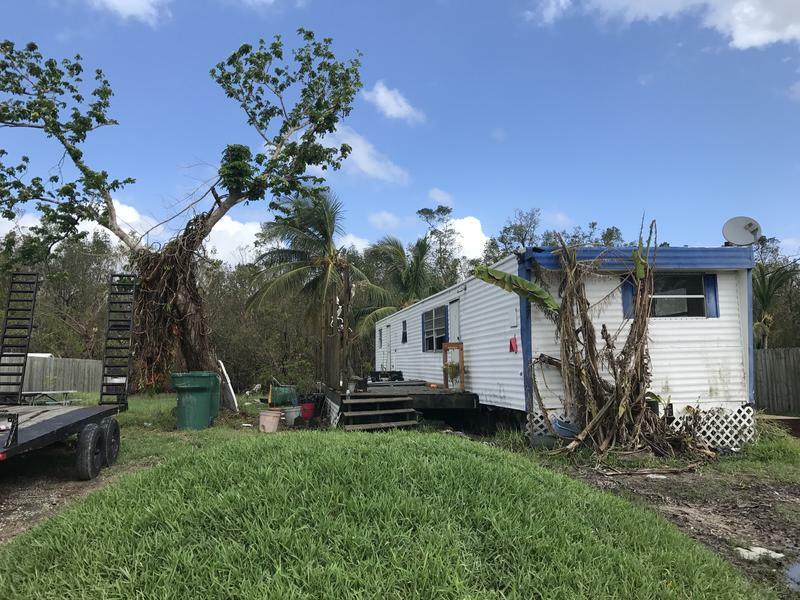 Summers says FEMA is planning to eventually use local hotels and rental properties to house the displaced people of Everglades City-- as well as bring in mobile homes. Everglades City interim Mayor Howie Grimm says he expects temporary housing relief from FEMA in about a week. "We're not gonna be forgotten. I’m not gonna let us be forgotten. If I have to scream and holler at every person I get on the phone to get what they need. I love the town. I love the people, and it's all about family and what we all are. I don’t care where you came from… when you go through an experience like this, you become family. So we're gonna look out for our family and we're gonna make it through it. It’s gonna be tough for a while but we'll be fine," says mayor Grimm. He says the long-term goal for housing in the Everglades City area of about 1,000 residents is to get every home on stilts to prevent this from ever happening again. Patty Demere and her son Augustus looking out of where a sliding glass door used to be from the living room area.